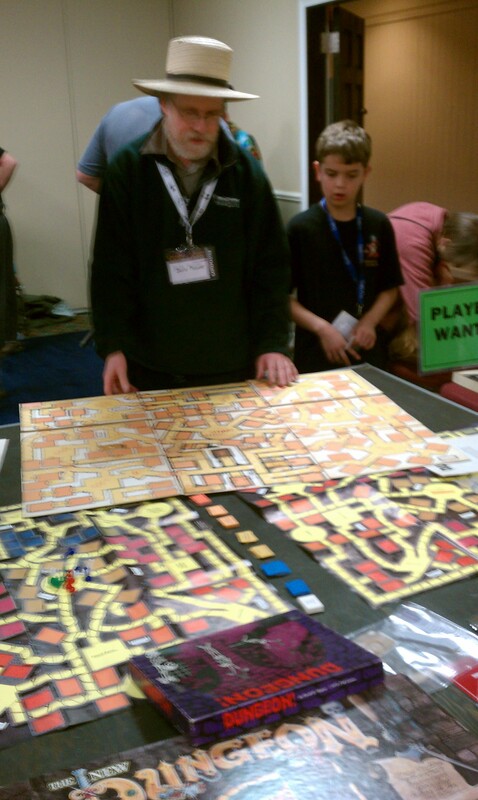 absorbing an invisible radiance from two artifacts Megarry brought to the convention – his original board for the Dungeon! 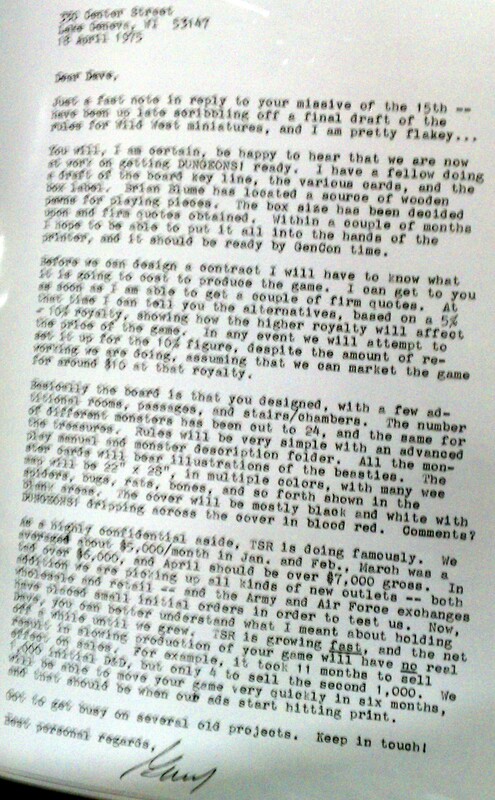 prototype, and the ping-pong tabletop from Dave Arneson’s basement on which the original Blackmoor sessions etc. were played out. Both can be seen in the picture to the right. As I heard it from David Wesely, the story of Dungeon! is inseparable from the story of Dungeons & Dragons. After a few sessions of the Blackmoor campaign, Arneson’s group had explored all of the parts of Castle Blackmoor that could handily be represented by the “Branzoll Castle” model on that ping-pong table. This was back in ’71 or so, well before D&D came into being, and – if I understand correctly – before they were using rules for Blackmoor at all; adapting Chainmail mechanics to provide more structure for the Braunstein-style game play came some time after the first dungeon adventure. 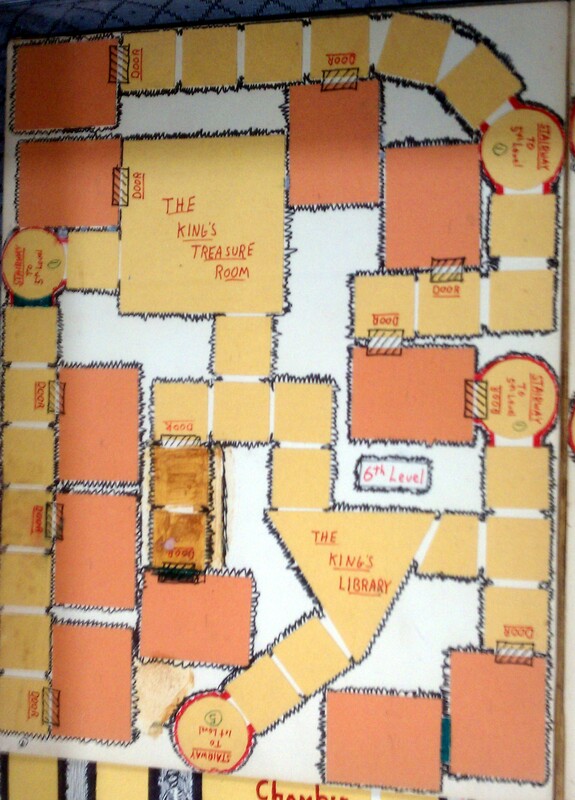 So Arneson decided to use pen and paper to map out the dungeons beneath the castle. (A possible inspiration might have been the siege rules in Chainmail, where the players use pencil and paper to track the progress of their sappers, but at Gen Con ’09 I also heard Arneson talk about using similar hand-drawn maps to deal with fog of war situations in their pre-Blackmoor, pre-Chainmail Napoleonics campaigns which were otherwise played with miniatures). Apparently Arneson didn’t think that the invention of the dungeon was anything special, but after the session Megarry raved to him about what a great concept it was. For Arneson it might have been a nifty solution to the problem of not having miniatures to represent everything; Megarry perceived that it was an even better solution to the problem of endless free choice. On an unbounded tabletop, you could go off in any direction you liked. This was a difficult for the referee who had to be prepared for 360 degrees worth of adventure, and having too many choices made it hard for players to reach meaningful decisions. Being a computer science student, Megarry saw that the dungeon acted like a flowchart, providing players a way to visualize the choices available from any given point and referees a way to present a manageable set of options. 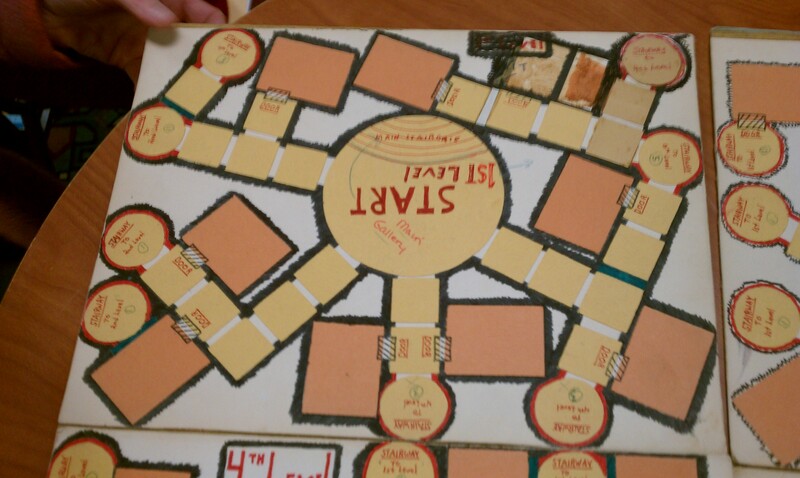 Excited about this conceptual breakthrough, Megarry proposed to Arneson that he would create a board game based on the dungeon idea, while always giving credit to Arneson for having come up with the concept. A handshake agreement was reached, and the stage was set for the development of what we now know as Dungeons & Dragons. There’s a great deal more to be said about all this, which I will undertake in future posts; this is just the starting square in an multi-level exploration, not unlike the one in the prototype at right. After last night’s Dwimmermount session at the Brooklyn Strategist, we were doing a post-mortem about how it had been awesome when we were using miniatures on the section of the dungeon that I’d fully laid out with Master Maze, but as soon as we ran out of pieces to build new areas explored in play we started getting confused about who was doing what where. The solution is straightforward – Stefan will come back from Prague and we’ll borrow more of his personal collection; also he is a skilled enough builder to take apart one part of the layout and use it to create a new area at the speed of exploration, so either he’ll be there to help out or someone else will contribute (or learn) that skill. But being of a theoretical bent, we kept chewing over why the problem arose at all. DAD: Well, you know how you have to eat your popsicle fast in the summer because the hot sun melts it? SON: I think it’s private parts. DAD: OK, you got me. All pop songs are about private parts. In that I hear my nostalgia-for-things-I-never-knew for the days when arguing about wargames over a sand table was an imaginary haven from the real war in another country. In my mind that time seems to have a purity and innocence that ended after D&D’s success cracked this world open. The war outside was over, to be replaced by dirty civil wars within TSR that were soon to be mirrored by the culture wars in which D&D was the devil. That’s the era I remember, in which the AD&D books seemed already artifacts of a magical time long past. The video does this well as the shadow moves through the aisles between crates of records and adventure modules. Pulling out any one of them would teach me about how it felt to be alive in a time of magic, and that time had to be now because I was holding some of it in my hand. But I had the sense that the wizards who could teach me how to perform that magic on command were gone, even when I was young and this wasn’t really true. I’ve been thinking a lot recently about the formation of TSR. I feel I’m old enough and have shared enough of the same experiences that I can put myself into the shoes of Dave Arneson or Gary Gygax or Don Kaye: as an idealist and a hobbyist and a gamer, as a publisher alternately elated or terrified by success, as a father and as someone who would have invested my life insurance into my friends’ dreams if Kickstarter didn’t avert that particular tragedy. I’m not comparing myself to these guys, just saying that having played in a sandbox filled with toddlers I have a little more insight when I roleplay a giant. My omen that John Lennon had been killed was when, exploring a deserted beach, I saw that someone had written STRAWBERRY FIELDS FOREVER in giant letters on the sand. After a long time alone bemused by this, I came home to the news. All the wonder and dread of that writing in the sand collapsed into a specific sadness: now I will never see the Beatles reunite and play live in concert. I guess I was as self-centered in 2008 as I was in 1980, because I had basically the same reaction to the news of Gary’s death. There is no question that the D&D game was the first of its kind, and from its success there sprang a whole industry… I did the AD&D system to go beyond that. Right now I’m working on something new to contribute to Fantasy Role-Playing Gaming. All of that, however, owes the Original D&D game far more than credit for “inspiration”. The D&D game was and remains the start of role-playing games. Dave Arneson and I have spoken frequently since the time we devised D&D. We don’t plan to collaborate on another game, but just maybe one day he’ll decide to combine talents again. Who knows? This is as bittersweet with lost possibility, as rich with bruised tenderness, as the point where Lennon and McCartney are hanging out together in New York in 1976 watching Saturday Night Live (there is something sad about a rock star even in life). The two men have been making nice in the press for once about what was good about the thing they built together, and now Lorne Michaels is holding up a check for $3,000 and offering it to the Beatles if they’ll reunite and play a show there and then. Probably not. At the time it was just a joke that’s only imbued with significance in hindsight, right? But there, that’s the problem.